Earlier this year Arch Enemy shocked fans by announcing the departure of vocalist Angela Gossow. Rather than leaving fans to speculate, they announced her replacement at the same time - Alissa White-Gluz from The Agonist. Alissa was chosen by Angela Gossow herself, and Arch Enemy not only announced her arrival, but at the same time released the first video from the upcoming album, War Eternal, so fans could hear straight away how the new lineup would sound. When the announcement was made I though Alissa was an excellent choice - she's a great singer and can do clean vocals as well as the growls, and is also a good performer. Having listened to the album a dozen or so times now I'm even more convinced that the band made the perfect choice. The vocals on the album are all of the growling style that Arch Enemy fans are used to, and like Angela's vocals the growls are such that you can still understand the lyrics (sadly not the case with many bands where the singe could be reciting his shopping list and you'd never know). The change in singer is not the only lineup change on this album - this is the first album since the departure of guitarist Christopher Amott. The album opens with "Tempore Nihil Sanat (Prelude in F minor)". As you might guess from the title, this isnt a typical Arch Enemy track - the "prelude in F minor" bit giving the clue as to the sound. Yes it's orchestral, and features a choir. At just over a minute in length it builds in tempo and power before it cuts out and the first real song "Never forgive never forget" kicks in. A howl of guitars followed by Alissa's powerful vocals gets us off to a flying start. Some seriously fast drumming and use of blast beats for the first time in an Arch Enemy song coupled with great guitar work gives the song a brutally fast heavy pace, and really shows the fans that a change of vocalist hasnt seen Arch Enemy slowing down or going soft. 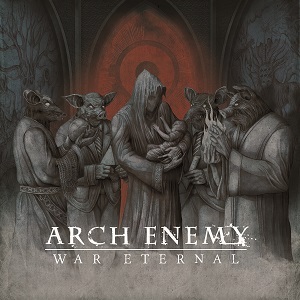 "War eternal" was the first song released from the album, and it's the one most similar to the material from Khaos Legions. Watch the video below if you haven't heard it. "Graveyard of dreams" is a short instrumental. "Avalanche" sees the use of the orchestra, and shows a willingness to experiment. It's still packed with the standard Arch Enemy ingrdients - great guitar work heavy drum sound and excellent growly vocals, although at times in this song the vocals stray toward a more clean vocal style. I have been a big fan of Arch Enemy with Angela as singer, and this new album with Alissa singing is definitely living up to the standards set by Angela. I think this is an excellent album and is highly recommended.